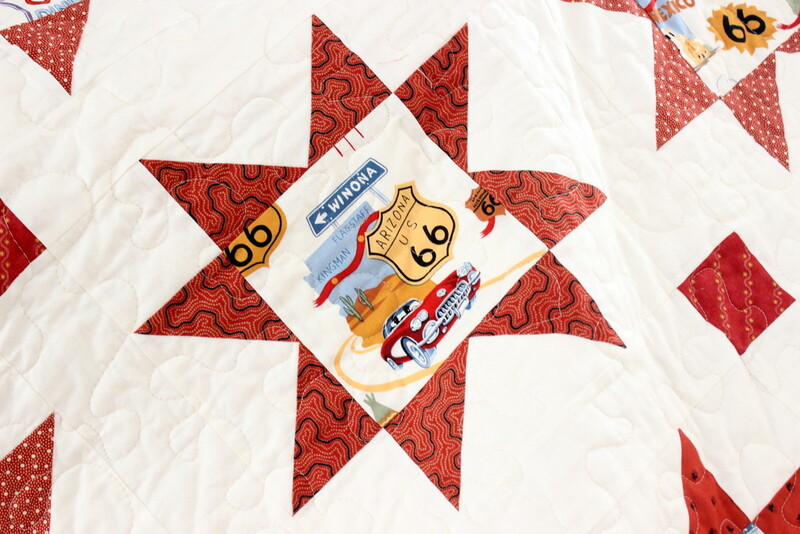 My dad’s Route 66 quilt is finally in the books, after its humble beginnings in a trash bag in the back of the closet. 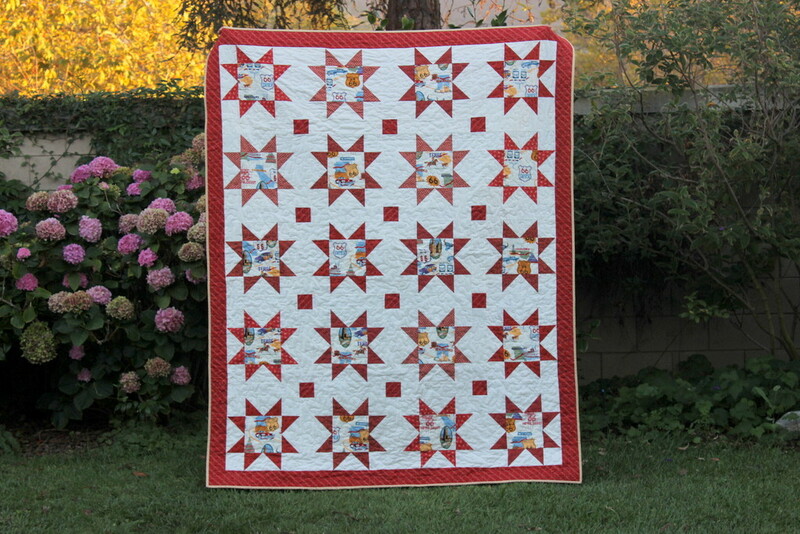 I’m happy with the red and white front and actually really pleased with the pieced back. I was able to work in the fish fabric in a more subtle way on the back. I ran a little bit short on fabric, so I to even added in one strip of the camper fabric, but it seems more fun than horrendous now. 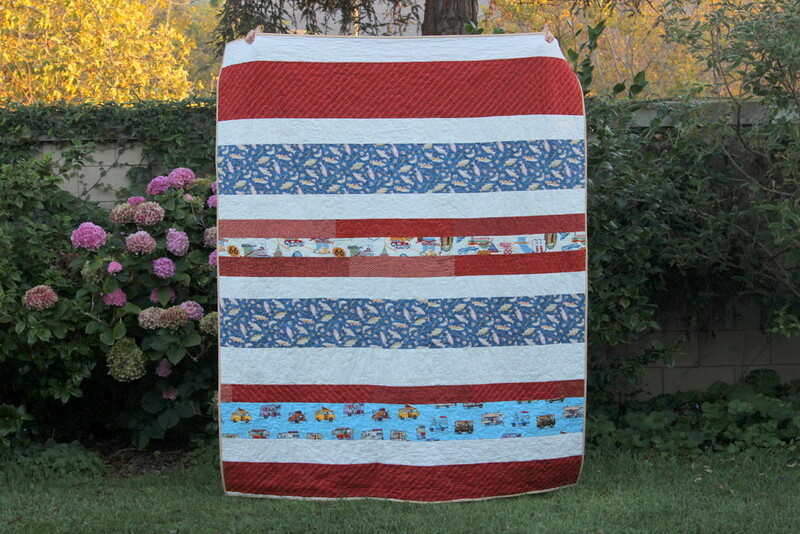 The awesome part is I used up just about every scrap of fabric I had bought for this quilt. I think the back was almost as much work as the front, as I just pieced it as I went and kept rearranging fabrics until I was happy. I spent quite the happy morning putting it together. 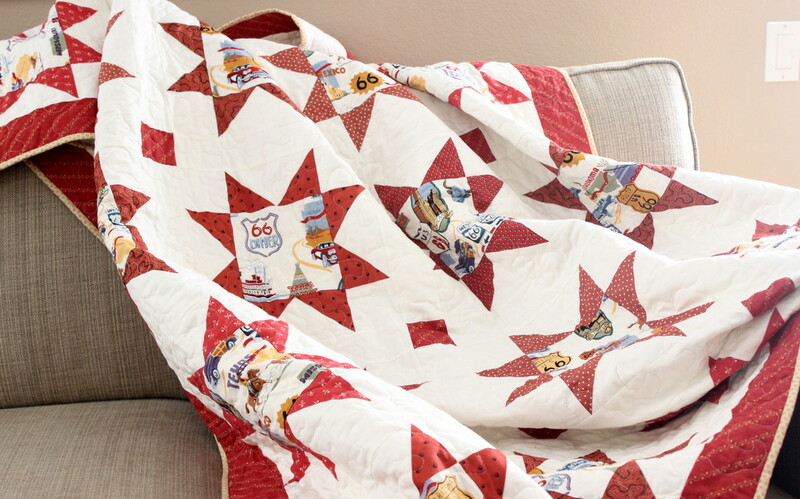 It almost feels like it’s a reversible quilt and I can picture it living in my dad’s trailer, keeping him warm for the many days that he is on the road. 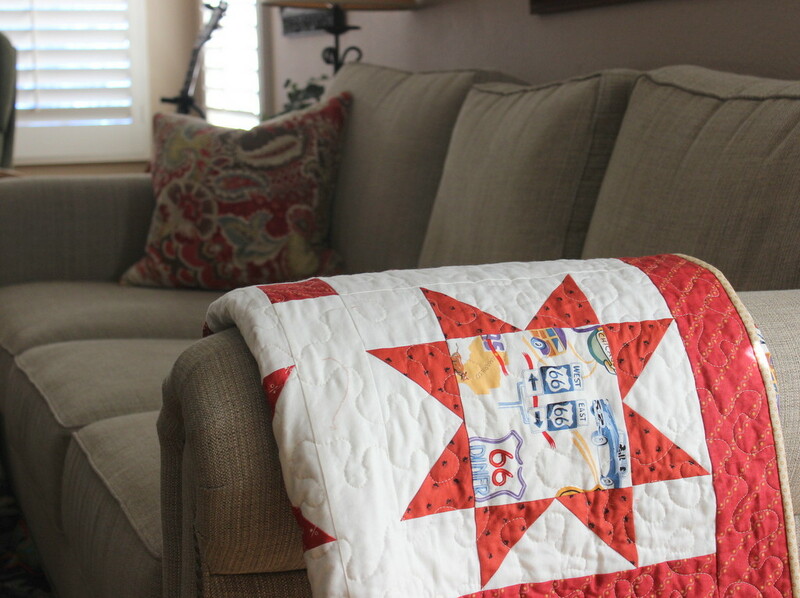 The quilting of it was another story. I just did an all over meander but it was a struggle the entire time. First of all, I don’t have a great set up for quilting a larger quilt. My machine is on the dining room table and has an extension table on it, but it just kept getting hung up on it. 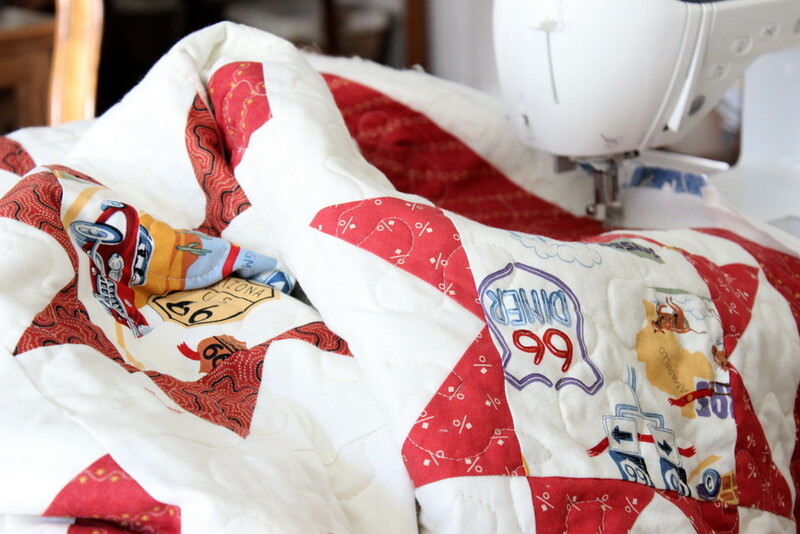 And even though I did warm up quilting before starting, checking my tension on the front and back–there are tension issues on the back of the quilt. This disappoints me so much, but I keep telling myself that no one but me would ever notice. It’s all washed and crinkly now, which hides these imperfections even more. But still, I know they are there. An exercise in letting go, I guess. Still, I know that he will love it. I’m headed out to Idaho tomorrow for his surprise birthday party and I cannot wait to spend time with some extended family members that I haven’t seen in almost 20 years. It is a crazy busy weekend back home and I am so sad that I am going to miss the Girl’s senior Homecoming dance. Of course, we didn’t know that when we scheduled this party. The silver lining to that situation is that she is going to Facetime me when she is ready and lots of aunts and cousins will be able to see her all dressed up in her Homecoming finery. I’ll have photos of that next week.